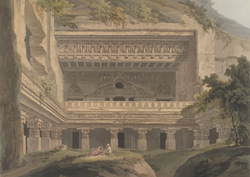 Plate 22 of 'Hindoo Excavations in the Mountain of Ellora near Aurangabad', engraved by Thomas Daniell (from the drawings of his deceased friend James Wales), which Daniell regarded as the sixth set of his 'Oriental Scenery'. The cave known as Vishvakarma (named after the archietect to the gods), is a 7th century cave and one of the latest rock-cut Buddhist chaityas in Western India. The elaborate façade at the end of the large open court has a pillared verandah which admits into the long interior (see plate 23), with an open gallery above. The gallery's roof is carved into the imitation of a wooden one with ribs and rafters, and above it is a series of auspicious mithuna (or loving) couples. In the rear wall of the gallery, which is decorated with celestial flying figures, windows, one circular within an arch (a relic of the horseshoe shaped arches of early Buddhist chaitya halls), admit light into the interior.